Use desk pads and coasters. Writing on a piece of paper directly over your veneer conference table or desk can irreparably damage the beautiful surface. Instead, try using a desk pad to write over, and provide employees with desk pads around your conference table. Be careful not to use desk pads with a plastic backing, as these can cause scratches. Leather and fabric desk pads, however, are soft enough to protect your veneer. In addition to writing over a protective surface, you should also be sure to keep coasters within reach to prevent water and heat damage caused by beverages. Keep your desk or table out of direct sunlight. 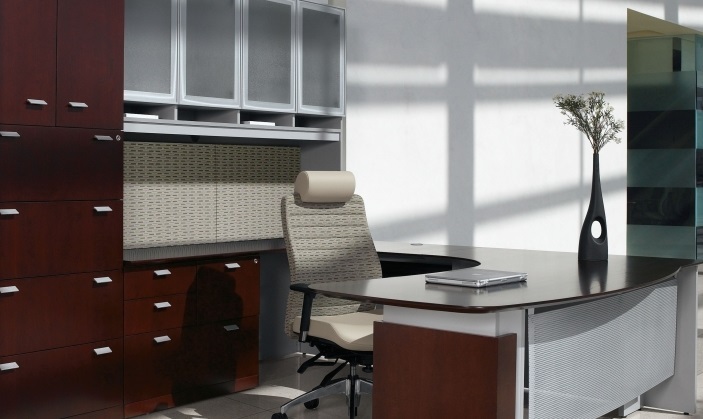 Sunlight can damage veneer over time, so do your best to keep your desk or table out of it. If the desk or table has to be under direct sunlight, you may want to move items on the top of it around from time to time to ensure that the entire surface is exposed to an even amount of sun over the years. Add a glass top. If you really want to keep that wood looking brand new, you may opt to purchase a custom glass top for it. This is a great option and alternative to needing desk pads and coasters. If you decide to go this route, be sure to use felt or silicone bumpers in the corners between the glass and veneer so that the glass isn’t directly on the wood. Clean your desk or table regularly. Don’t wait until your table is already damaged before giving it a good wipe down. Take the time to clean your veneer often, and consult the manufacturer of your furniture for specific cleaning instructions. For general cleaning, use a lint-free, soft cloth. You can use a dry cloth or dampen it in a mild soap and water mixture. Avoid using aerosol cleaners, polishes or oil-based or wax cleaners.